Super7 is proud to be a sponsor of the 2009 Supermarket Street Sweep! The Supermarket Street Sweep is an annual bike race that benefits the San Francisco Food Bank! For the past three years, hundreds of participants have zipped around the city to local supermarkets and brought back thousands of pounds of food to donate to this valuable charity. 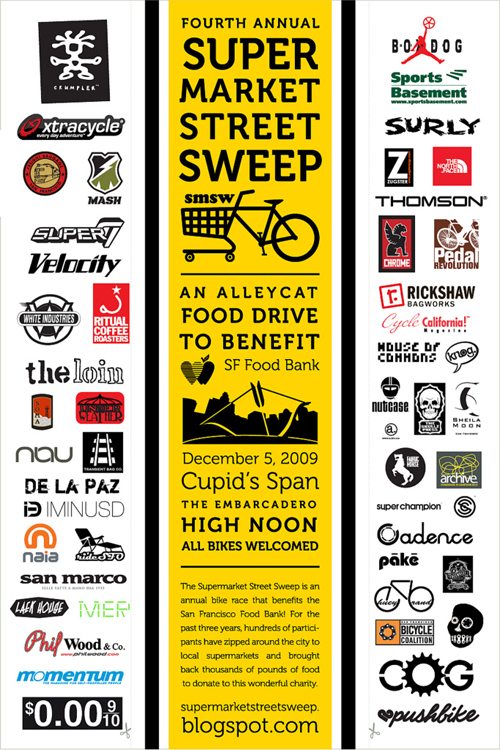 This year's race will take place on December 5, 2009 – Come out to participate in this alleycat to benefit the San Francisco Food Bank! There will be a speed race and a cargo race. All riders and all kinds of bicycles are welcome. Racers should arrive at the Bow & Arrow between 11:30am-12:00pm to register. This is a really fun event for a great cause. Last year's food collection was enough to provide over 4,000 meals to those in need. 2006: 80 racers brought in 1,172 lbs of food! 2007: 110 racers brought in 1,595 lbs of food! 2008: 150 racers brought in 5,266 lbs of food! 2009: Let’s see how much we can raise this year! Information on the cargo race. Information on the speed race.